Jamie has travelled around Italy to find the best of fast and slow cooking, Italian style. Enjoy the worlds favourite cuisine in your kitchen at home with Jamie's tried and trusted recipes. 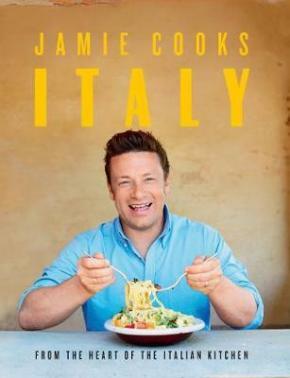 Jamie Cooks Italy is a celebration of the joy of Italian food. Jamie wants to share his love of all things Italian with accessible, best-ever recipes for Classic Carbonara, Salina Chicken, Stuffed Focaccia, Baked Risotto Pie, Pot-Roasted Cauliflower and Limoncello Tiramisu. This is about bringing the pleasure and passion of the world's favourite cuisine to your kitchen at home. Featuring 130 recipes in Jamie's easy-to-follow style, the book has chapters on Antipasti, Salad, Soup, Meat, Pasta, Fish, Rice & Dumplings, Bread & Pastry, Sides, Desserts and all the Basics you need. The recipes are a mix of fast and slow cooking, familiar classics with a Jamie twist, simple everyday dishes and more indulgent labour-of-love choices for weekends and celebrations. Whether cooking for yourself or cooking for friends and family, the aromas and tastes will transport you straight to the landscapes of Italy. Viva Italia!